1896 - "The Great Storm". 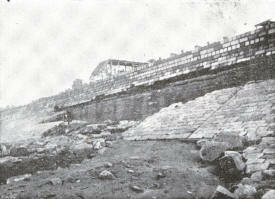 The Great Storm of 8th October 1896 wrought havoc along the Fylde Coast. 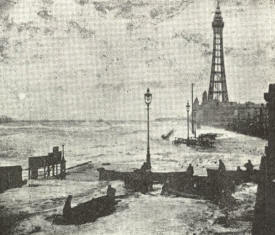 High tide at Blackpool, 8 October 1896. 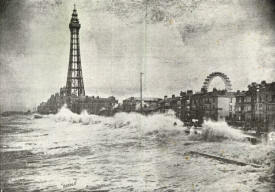 Blackpool Promenade during the storm. Destroyed hulking opposite the Imperial Hotel. 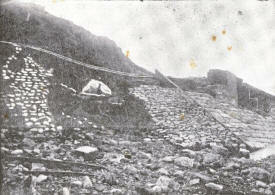 The Gynn Slade, at the northerly end was completely demolished and part of the road undermined. Poulton Road, Fleetwood. 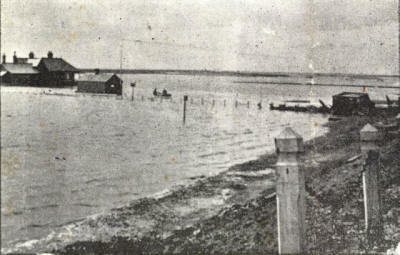 Floods extended as far as the Strawberry Gardens Hotel and did much damage to property. 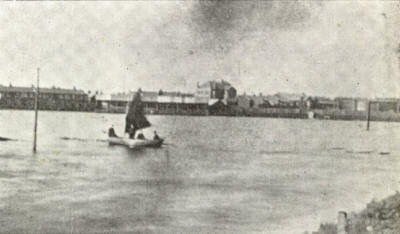 Boating on the flooded Fleetwood Rangers' Football Field. One of the strangest effects of the storm and tempest of last week was the inundation of a large tract of land at the growing watering-place of Fairhaven. The fury of waves dashing with much persistence on the new sea wall along a portion of the front was such that the wall gave some distance along, and in a moment there was a vast of waters across the long strip of low-lying land comprising golf links of the Fairhaven Golf Club. The onrush of the waters with such unexpected suddenness and with such impetuous force, took by surprise some members who were in the clubhouse, and the stewardess, Mrs. Davenport. They were quickly surrounded by the rushing waters, and as the depth of the water was rapidly increasing they had no alternative but to wade ashore. Furniture was fetched from the clubhouse in boats, and deposited upon the shore of the now huge newly-formed lake, for the whole area of the links right away to the Bungalow was submerged, and the strong sou'wester lashed the water into great waves. It was impossible to empty the lockers in the club-house, and the red coats and golf-clubs of the members were rendered useless by their contact with the salt water. Quickly the water rose as the tide rushed in until the waves actually reached the eaves of the club-house, washing to and fro as though they would bear the building from its foundation. In a short time, however, the water began to recede, and it was only for a few moments that this remarkable picture presented itself. By the time our photographer arrived the water had very considerably subsided, yet he was able to obtain a picture which gives a fair idea of the extent of the flood and of the desolate outlook as one gazed across the waste of waters. 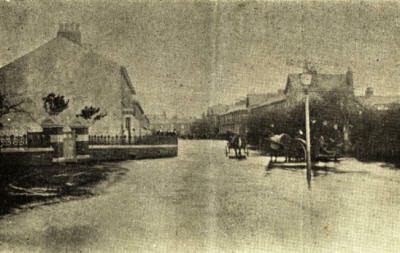 The second illustration shows the Lytham end of the flooded links, with a pile of household goods on the bank as they were conveyed ashore by boat. 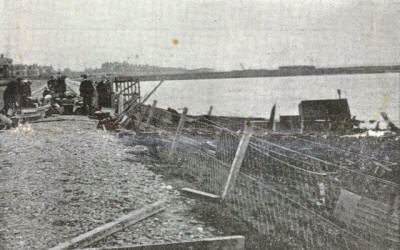 To the right of the picture is an accumulation of timber and other wreckage washed up on to the embankment. The model lifeboat “Kilgrimol" designed by Mr. Allen, of St. Annes, lies stranded on the lake side.